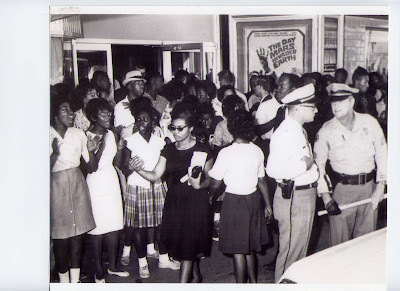 PHOTO CAPTION: Protesters in Tallahassee, Florida—including my mother, Patricia Stephens Due (in sunglasses, front center), and my father, John Due (profile beneath movie poster)—demonstrate against segregated seating at the Florida Theatre in 1963. I know a bit about fear. Most of my novels are about otherworldly events, when unimaginable circumstances force my protagonists deep into their character to discover who they are. I revel in those stories of human grit; I suppose it’s my way of preparing for those times when life gets tough. A death in the family. A child’s illness. An alarming medical exam. A car accident. A violent crime. Those specters frighten me far more than notions of ghosts, curses and demons. Since childhood, I have lived deeply within the awareness that life is only temporary. My civil rights activist parents taught me a long view of history, and I know how quickly today’s headlines are tomorrow’s archives. In that spirit, I am saving my magazines featuring Barack Obama, and my parents are taping news reports. No matter how the United States Senator from Illinois performs in the primaries to come, those mementos are chronicles of change. I’ll file those magazines and newspapers side-by-side with my parents’ archives from the civil rights era, like the telegram my mother received from Dr. Martin Luther King, Jr. in 1960, after she and four other students from Florida A&M University (including my aunt) chose to spend 49 days in jail rather than pay their fines after being arrested for ordering food at a Woolworth lunch counter in Tallahassee, Florida. They became the nation's first Jail-In during the nonviolent student sit-in movement of the 1960s. My mother, Patricia Stephens Due, also has a letter Eleanor Roosevelt wrote on the arrested students’ behalf for a New York fundraiser. And a newspaper column written by baseball great Jackie Robinson, who helped publicize the Jail-In to the world by publishing my mother’s letter from jail. My father, civil rights attorney John Due, has campaign memorabilia from his 1966 run for the Florida Senate (“Do it with Due!”), when his fellow Democratic candidates got up and left so they wouldn’t have to share a table, or platform, with a black man. Change in the 1960s wasn’t easy. It took a movement to make it happen. But change can hurt in unexpected ways. Today, in the midst of history-making times on the political front—with the nation embracing a black man’s candidacy with startling vigor—I sense that there are some voters who are allowing fear to dampen their enthusiasm for Barack Obama. I exclude those voters who honestly think that Hillary Clinton or a Republican candidate would better serve the nation. And I’m not suggesting that any voter should embrace Barack Obama, or reject his opponents, simply because Obama is black. Poor leadership comes in all colors. I’m talking about voters who share Obama’s vision, believe in his leadership capabilities, and would embrace him with jubilation...except for their fears. I’m afraid he’s going to get shot. I’m afraid he can’t win. I’m afraid he’s too good to be true. Some voters, I fear, are in trance too. In trance, we don’t pay attention to whether or not our voter registration cards are up to date, or note the registration deadline for the primaries. We don’t call up our friends and talk to our neighbors. We don’t execute a few computer keystrokes to make a campaign contribution. We don’t forward emails or write in our blogs. We don’t knock on doors or organize car pools to polls. We don’t wear campaign buttons or paste bumper stickers to our cars. In the mean time, growing segments of America and Democratic party establishment—and even some conservatives—are doing exactly that. They believe in the United States of America that’s written on paper—the one we all want to believe in. They believe that the American Dream can be real. And they believe Barack Obama is the best person to march us all into that future. Why don’t they seem to notice he’s black? Because of Martin Luther King, Jr., Oprah Winfrey and Sidney Poitier. Because of Harry Belafonte, Bill Cosby and Shirley Chisolm. Because of Octavia E. Butler, Will Smith and Muhammad Ali. Because of Denzel Washington, Louis Armstrong and the Little Rock Nine. Because of Forest Whitaker, Angela Bassett and the Tuskegee Airmen. Because of Rosa Parks, Thurgood Marshall and Billie Holiday. Because of Cicely Tyson, Colin Powell and Michael Jordan. Because of Jesse Jackson, Jesse Owens and Maya Angelou. Because of Alice Walker, Miles Davis and Louis Armstrong. Because of James Baldwin, James Brown and Toni Morrison. Because of Jackie Robinson, Tiger Woods and Mae Jemison. Because they loved Dennis Haysbert’s President David Palmer on "24." Because of people like my parents. Because of MLK Day, Black History Month, the March on Washington, the Montgomery bus boycott, the Greensboro sit-ins, the Tallahassee Jail-In, the Civil Rights Act, the Voting Rights Act—and because of jazz, blues, funk and rock and roll. Women and men of all ethnicities and races sacrificed for change here on U.S. soil—far too many to name. And arena by arena, battle by agonizing battle, color shock has been muted across the country. It doesn’t mean racism is gone, as the uninformed are so quick to claim—it only means that its power has diminished enough that a black candidate as powerful as Barack Obama can stand for more than his skin color. And he can stand at his full height, without having to stoop. To the aging activists of all races who wondered if the seeds planted in the 1960s would bear fruit, Barack Obama answers that question with an exclamation point. His wildly successful underdog campaign thus far could bring a smile to a deathbed. But the reasons for Obama’s wide support are much simpler than that. This campaign has been about more than a flashback to Dr. King, John F. Kennedy and a boyish, winning smile—although Obama gives us that, too. He has an unfair advantage: We already know how singular he is. He’s a freshman politician running an unprecedented campaign against not one giant, but two—including a former U.S. president—all the while taking candidates from both parties to school. He had the audacity to believe he could do it, and he’s demonstrating that he can follow vision with organization and action. He was one of the few voices against the Iraq War when too many of us were afraid to speak. His oratory rings with intelligence and heart, and he’s already proven he can change the face of American politics. Oh yes, and he’s black. What if Barack Obama could get elected? What if he didn’t disappoint us? What if we didn’t lose him to a racist’s violence? What if he could not only be the first black president, but one of the best? Fear is a survival mechanism, so it must be powerful. But fear isn’t always healthy. Sometimes, fear lies. It feels like anger. Or fatigue. Or mistrust. Or apathy. Or self-righteousness. Fear has many names. If I had let fear stop me, I never would have started writing my first novel. Or submitted it to an agent—and kept on submitting it when it was rejected. I wouldn’t have moved to Hollywood to try screenwriting, or sold my first script. Or married the love of my life. I'm told that novelist Alex Haley used to say that you have to throw your hat over the fence and climb over to get it. Barack Obama has thrown his hat over a high fence, and he’s climbing. News accounts remind us every day that he’s already scaled up a mighty long way. Are we going to climb with him? Or are we afraid of the height? I agree with your take on fear. Mine has been that he would get hurt if elected, but I already decided that I would vote for him. That underlying fear man remain, unfortunately. so fantastic. thanks for these words. Obama won in S.C.! I asked everyone to ensure they voted. It was such a huge victory! And all races voted for him. Wonderful, wonderful post! I grew up in Nebraska and my best friend still lives there. She was stunned on Saturday when Obama took Nebraska. I think it was the moment for her when she realized he might could really do this thing. I know more and more are starting to realize the same thing!